16/07/2011 - Making the most out of the pole position, Edoardo Liberati ruled race one in Imola without seeing his leadership questioned throughout the race. The race was in fact tight only behind the Team Ghinzani's car, with Sergio Campana (BVM-Target) gaining two positions at the start and the Argentine Facu Regalia (Team Ghinzani) overtaking the Frenchman Brandon Maisano (BVM-Target) during lap two, while he was in fourth position, but then obtaining his first podium when Maxime Jousse (BVM-Target) went wide in lap seven at the Acque Minerali chicane. 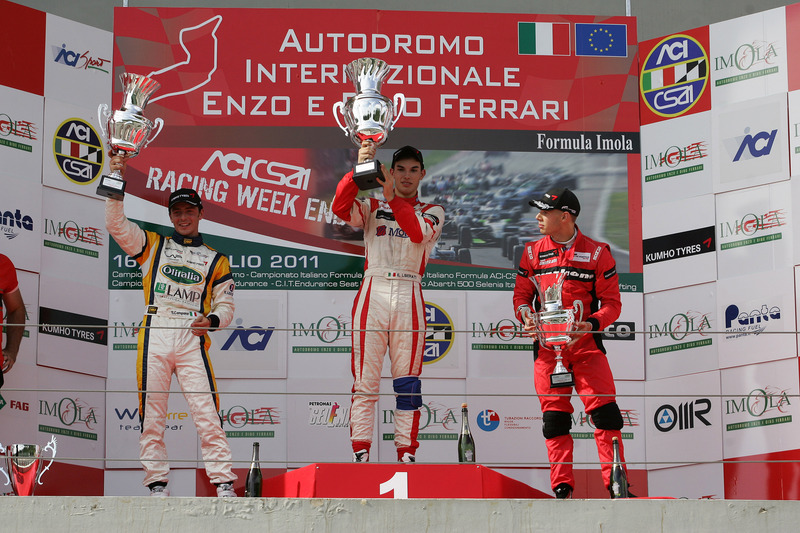 The top five was obtained in order by Liberati, Campana, author of the fastest lap of the race, Regalia, Maisano and Jousse; the sixth place was obtained by Michael Lewis who, after an error from the third position of the grid, attacked and overtook his team mate at Prema Powerteam, Raffaele Marciello, with the latter forced afterwards to stop in the pits due to the damage reported in the contact. Another duel between team mates was fought for the seventh place by Kevin Giovesi and the Brazilian Victor Guerin, both in force at Lucidi Motors with the two fighting also Marciello; the South American had the worse and went wide in the gravel trap to finish later on in last position, the twelfth. The two cars of RP Motorsport driven by Daniel Mancinelli and Niccolò Schirò ended the Top-10 behind Andrea Roda (Prema Powerteam), Federico Vecchi (Linerace-CO2 Motorsport) and Guerin who managed in the finale to have the best of Simone Iaquinta (Downforce Competition). Luca Marco Spiga (GTR Racing) ended in fourteenth, while Eddie Cheever's race (Lucidi Motors) ended in the formation lap when he had to stop his car after losing the rear right tyre. The appointment is now for tomorrow at 10.10 (local time, GMT+2) for race two's start. The starting grid will be defined for the first eight position by the inversion of the top eight drivers in qualifying: Giovesi will start from the pole, at his side Marciello and then Maisano, Regalia, Campana, Lewis, Jousse and Liberati.